Our meetings are to help beginners learn their mosses and liverworts, rather than high-powered recording sessions. All are on Sundays, and start at 10.30 a.m. Please bring sandwiches. You may wish to bring with you a copy of the British Bryological Society's Mosses and Liverworts of Britain and Ireland: a Field-guide (2010). 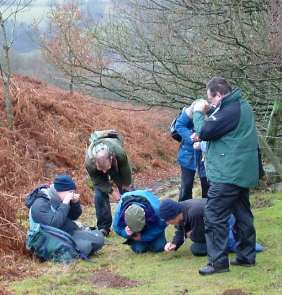 We will explore wet upland heath at Rhos Fiddle, a Shropshire Wildlife Trust reserve. Take the Crossways road out of Newcastle-on-Clun, fork left at Caldy Bank and carry on for 2.25 miles. Park on the verge just before the second cattle grid (SO 205857). We will examine the bryophytes of Longden Road Cemetery in Shrewsbury. Churchyards and cemeteries can be as interesting for bryophytes as they are for lichens, and we hope to prove this point on the day. The grid reference for parking is SJ 48546 11338. From the roundabout where the A5 and A49 meet on the south side of Shrewsbury, take the turn for A5112, also named 'Hereford Road' with signs for Shrewsbury. Continue along this road over a minor roundabout with a retail park on the right-hand side. At the larger roundabout named 'Meole Brace Roundabout' take the second exit left on to the B4380. Veer left by keeping in the left-hand lane, where signs will display Royal Shrewsbury Hospital. Continue along the B4380 until you reach a small (but often busy) roundabout and take the third exit. Shrewsbury Cemetery is the first right turn, and parking is immediately after the gates, with no need to continue along the small road within the cemetery. Meet at Coed Pendugwm (SJ 103143), a Montgomeryshire Wildlife Trust reserve, where we will explore the deciduous woodland. Bryologists can often find many species in built-up districts, where pavements and tarmac, mortared walls, roofs and soil offer a variety of habitats. We will put this statement to the test by exploring Presteigne in Radnorshire. Meet at the car park by the B4355 at the west end of Presteigne (SO 309651). Joint meeting with Worcestershire Moss Group, when we will explore woodland, grassland and a marshy stream on Bringsty Common in east Herefordshire. If time allows, we may also visit the woods of Brockhampton Park on the north side of the main road. Turn off the A44 at a sign to the 'Live and Let Live' public house, and park at SO 698550. You may also be interested in purchasing a copy of "The Mosses and Liverworts Of Shropshire" by Mark Lawley (2013). Mark Lawley's new book "Wildlife in the Marches" (2015) contextualises natural history in the wider scope of social history. The book can be ordered online from Amazon, or by post from Marches Publications, 12A Castleview Terrace, Ludlow, Shropshire SY8 2NG. Please make your cheque for £34.50 (which includes £6 P&P) payable to ‘Mark Lawley’. You may also be interested in the Herefordshire Botanical Society.